Prototype Self Parking Car with Raspberry Pi @Raspberry_Pi #PiDay #RaspberryPi « Adafruit Industries – Makers, hackers, artists, designers and engineers! We are offering a solution to the most feared part of a driver’s test – parallel parking. Driving through the city, it is a grueling task finding a parking spot. But squeezing your car into it is a whole different ball game. Wouldn’t it be great if you could just press a button let your car take care of this? 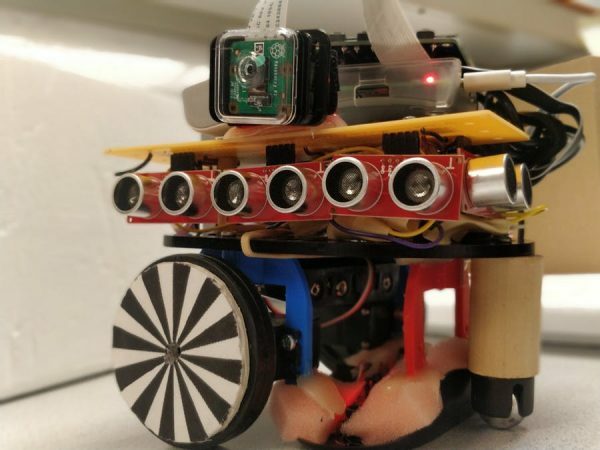 We have built a low-cost prototype for implementing a parallel parking algorithm on a mobile robot car, using a Raspberry Pi, camera, ultrasonic sensors and an optical sensor. A hardware push button starts process of self-parking the car. On pressing the button, the robot moves forward, while scanning for vacant spots on the side using ultrasonic sensor array and the camera. On finding a suitable spot of appropriate dimensions, the robot moves forward and stops at an appropriate distance. The robot then makes a 45 degree turn and back up into the spot. The ultrasonic sensors at the back of the robot allows it to move backward till the obstacle. Then the robot makes another 45 degree in the opposite direction to become straight. After this using the front and rear sensors, the robot can park itself within the spot.